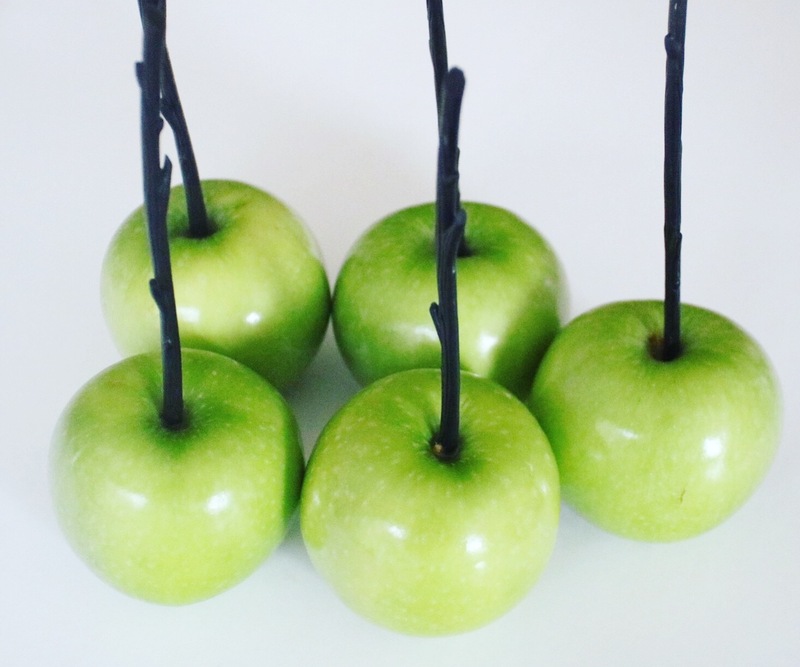 What’s better than candy apples you ask? 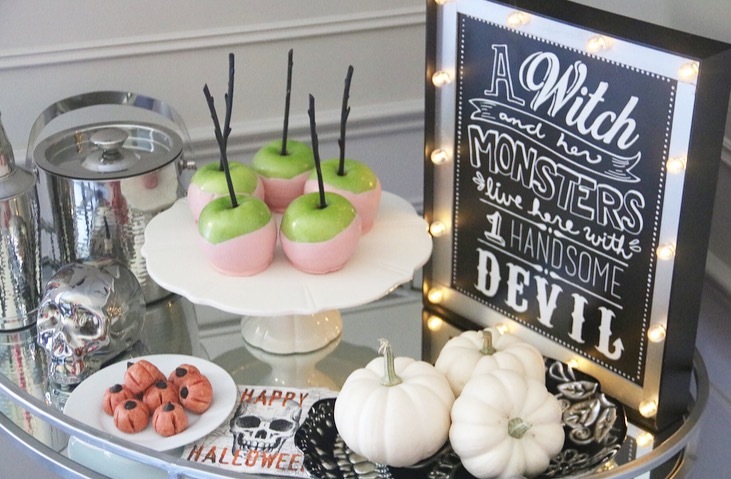 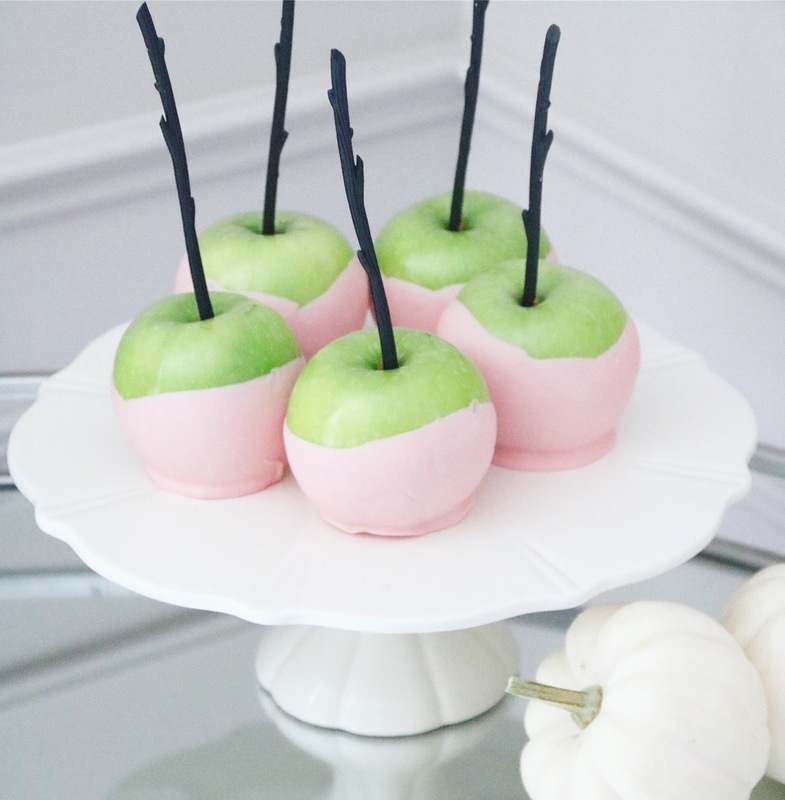 Pastel pink candy apples of course! 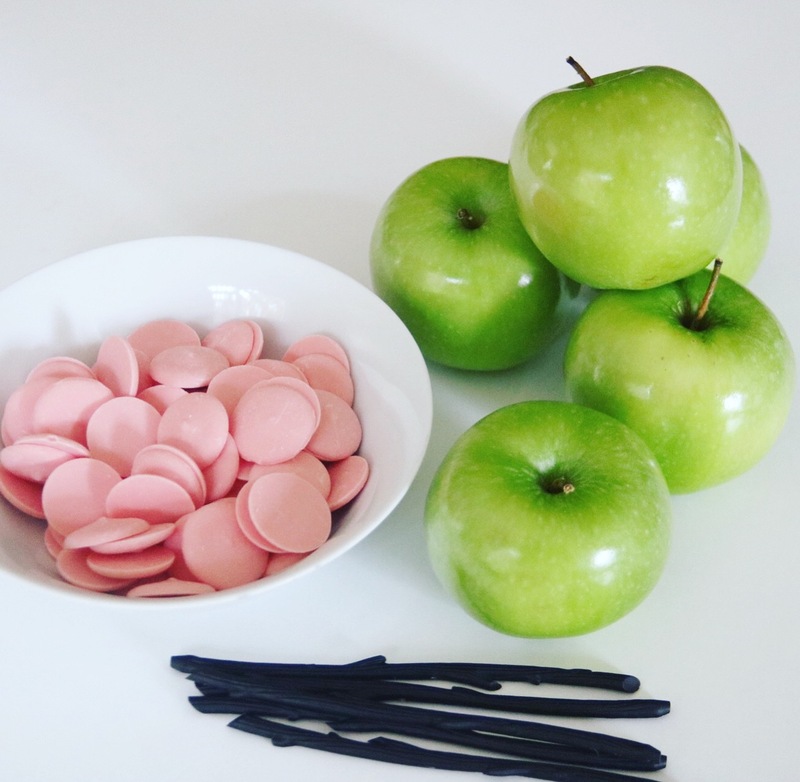 You won’t feel as guilty indulging in these treats after all, they’re made of fruit so they’re partially good for you, right?! 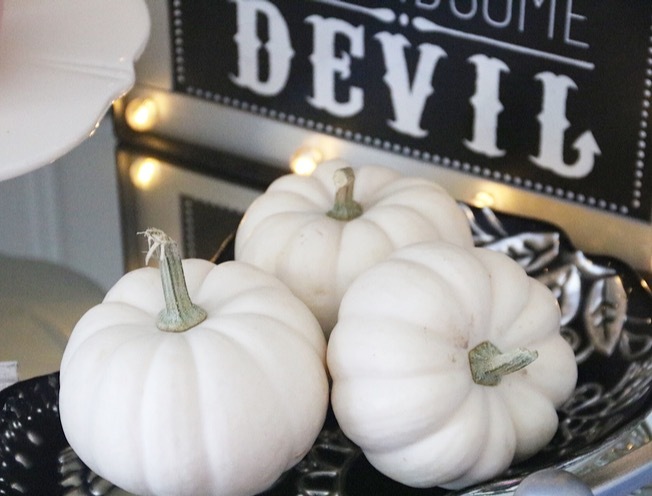 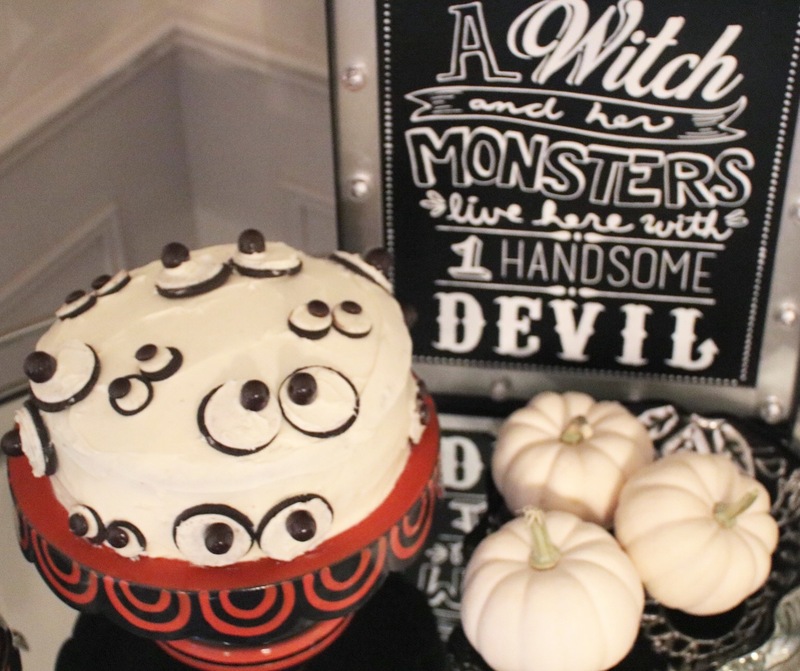 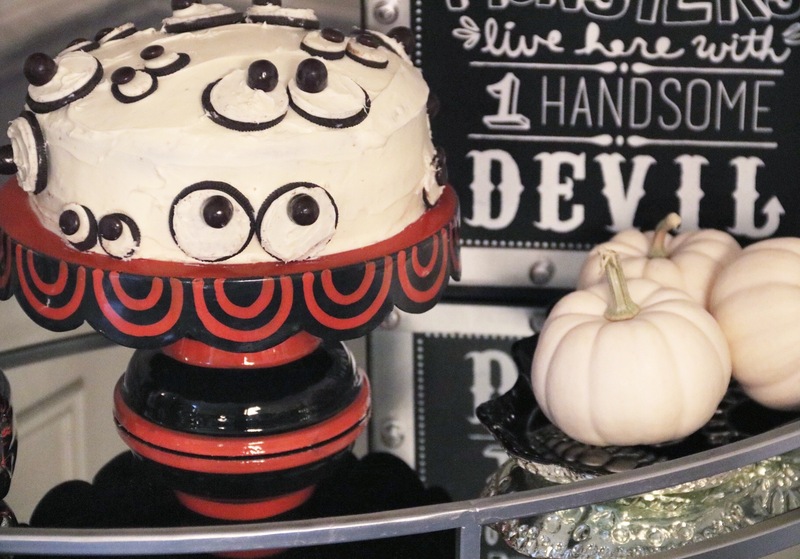 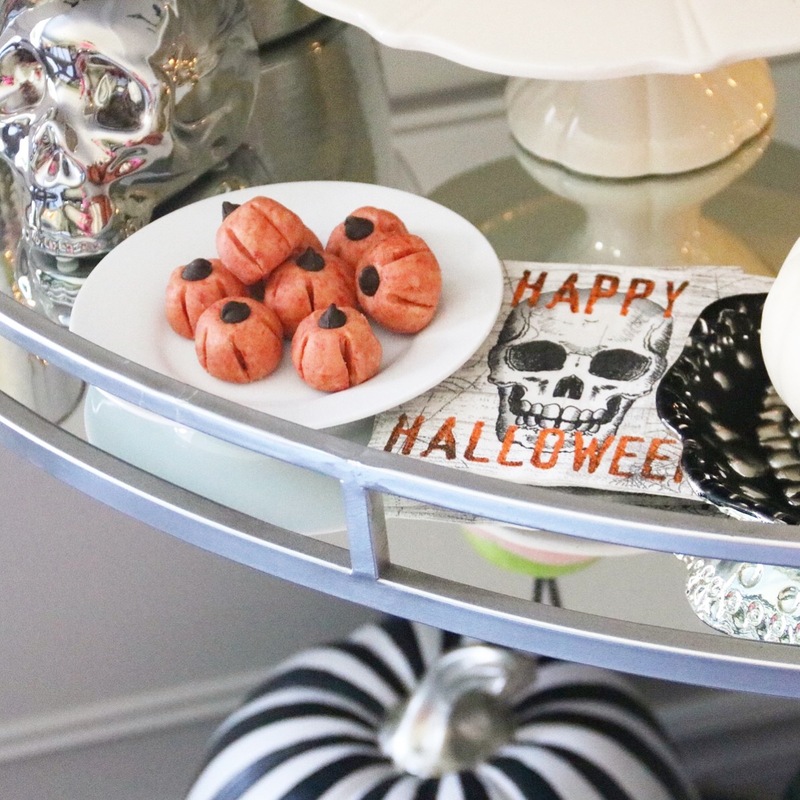 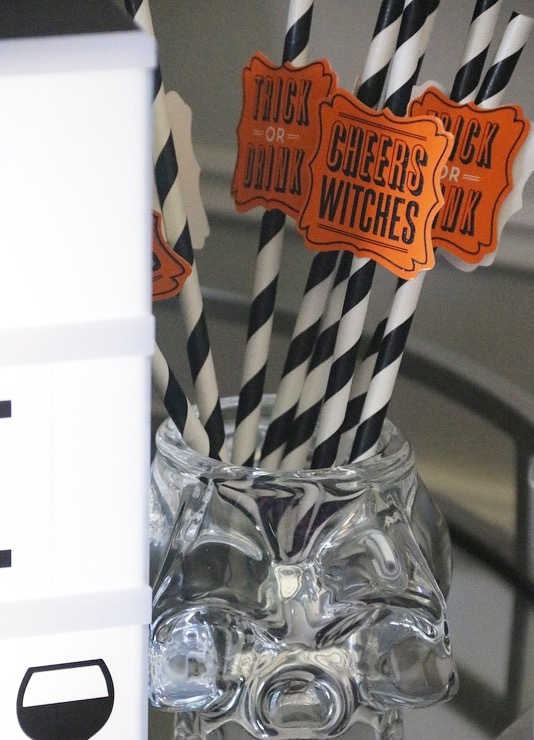 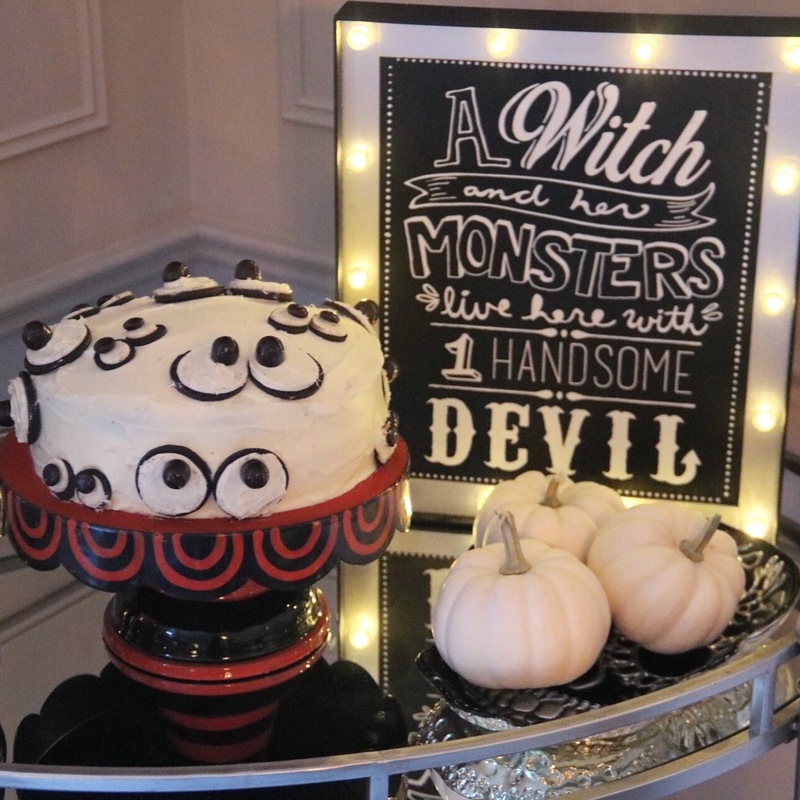 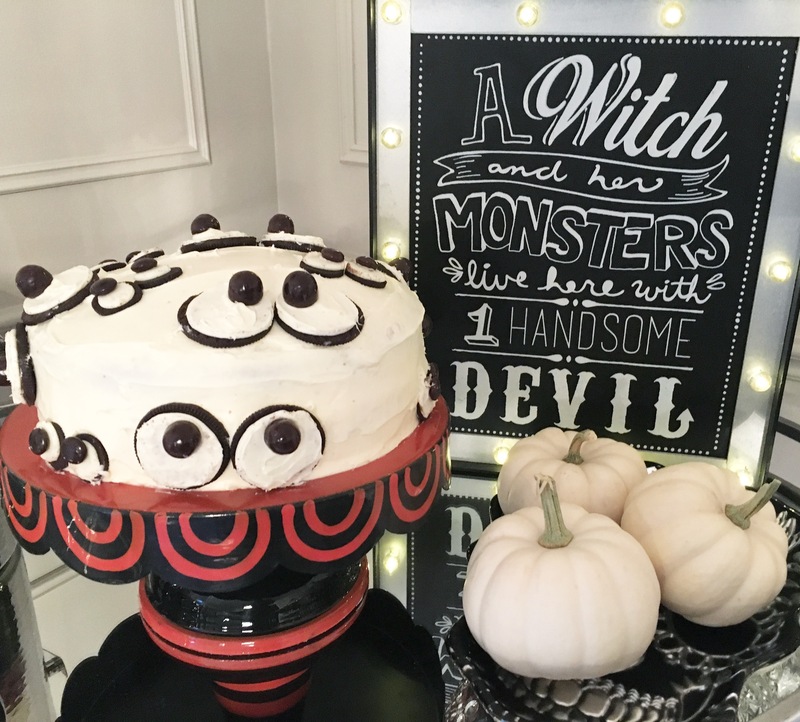 You will definitely want to add these to your Halloween desserts when you find out just how easy these are to make! 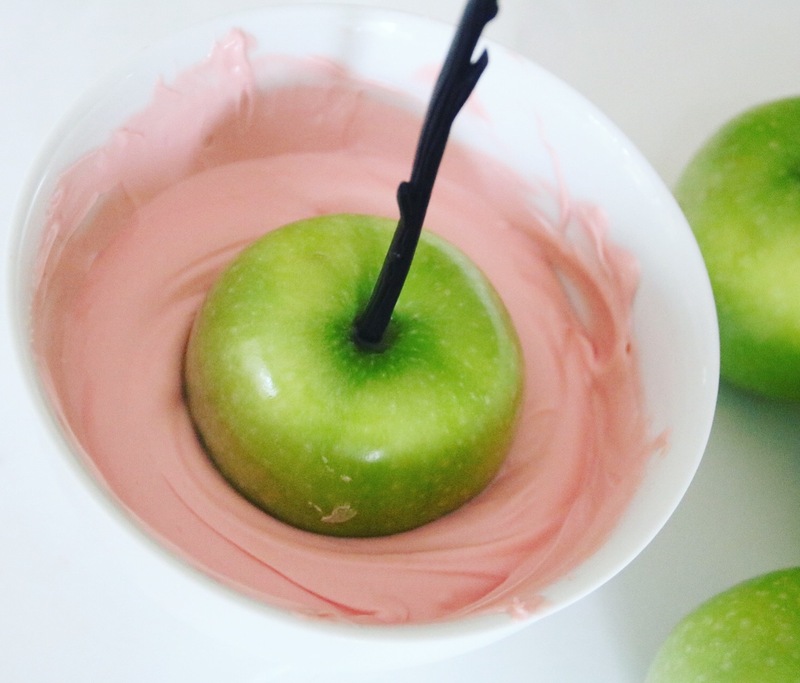 Traditional candy apples are made up of a mixture of corn syrup, water and sugar that are boiled until they’re the perfect and sticky consistency for dipping. 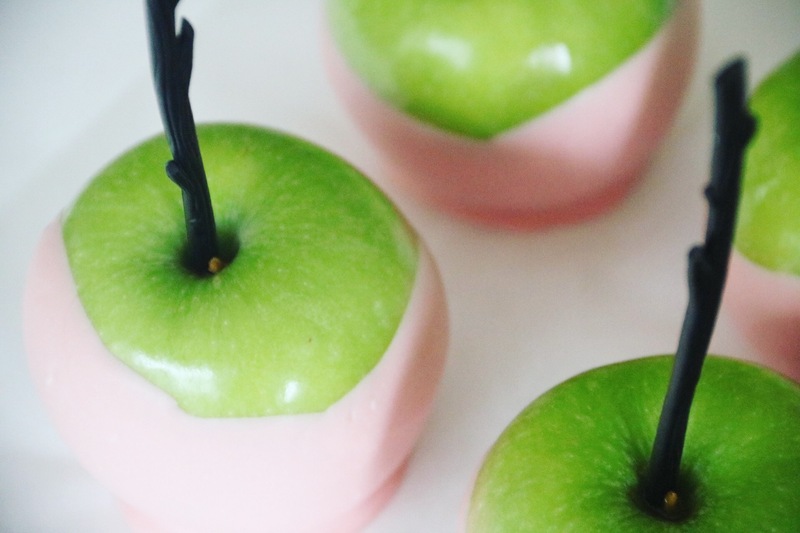 MAJOR TIME SAVING HACK: use candy melts (available at Michaels and Bulk Barn), melt them in the microwave or double- boiler on the stove, dip your apples, and VOILA! 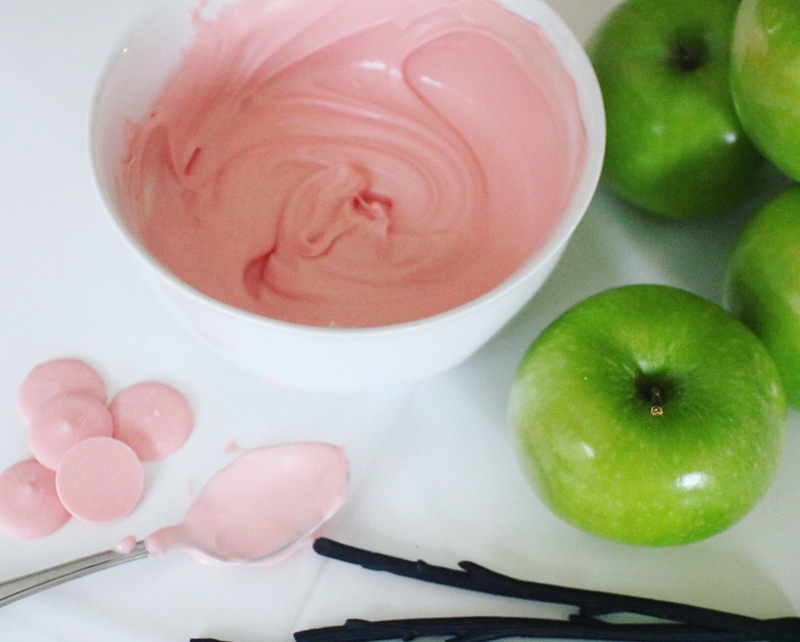 Just like that, in a few minutes you will have beautiful “candy” apples! 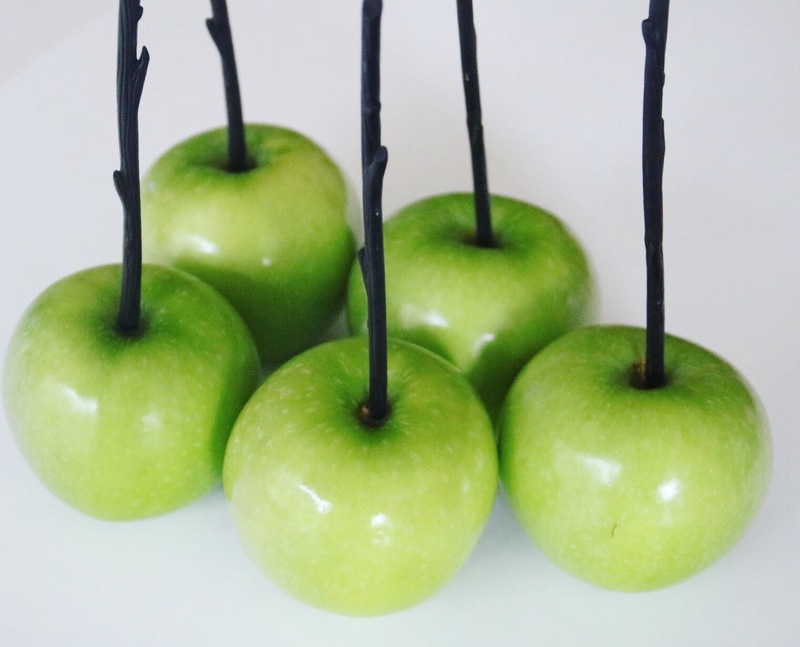 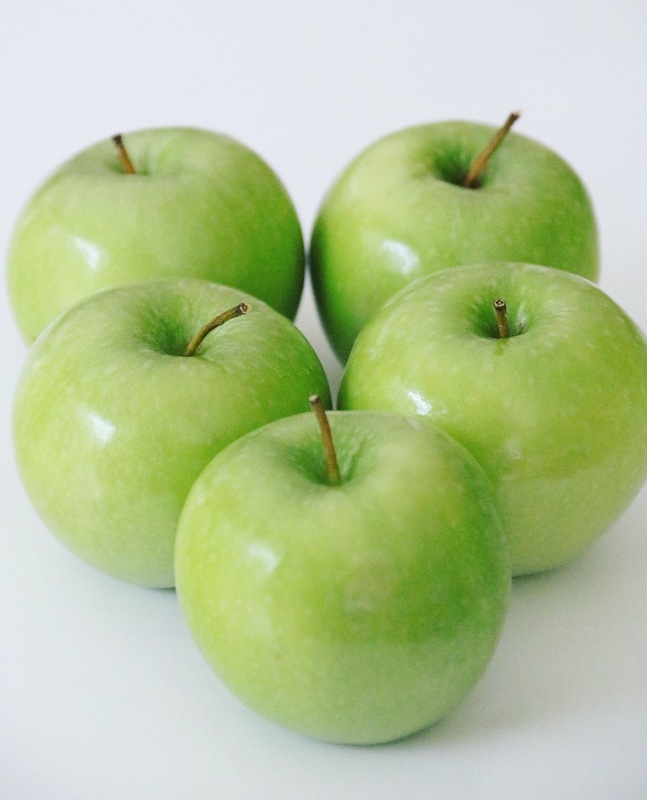 Cake stand or platter to display your beautiful apples! 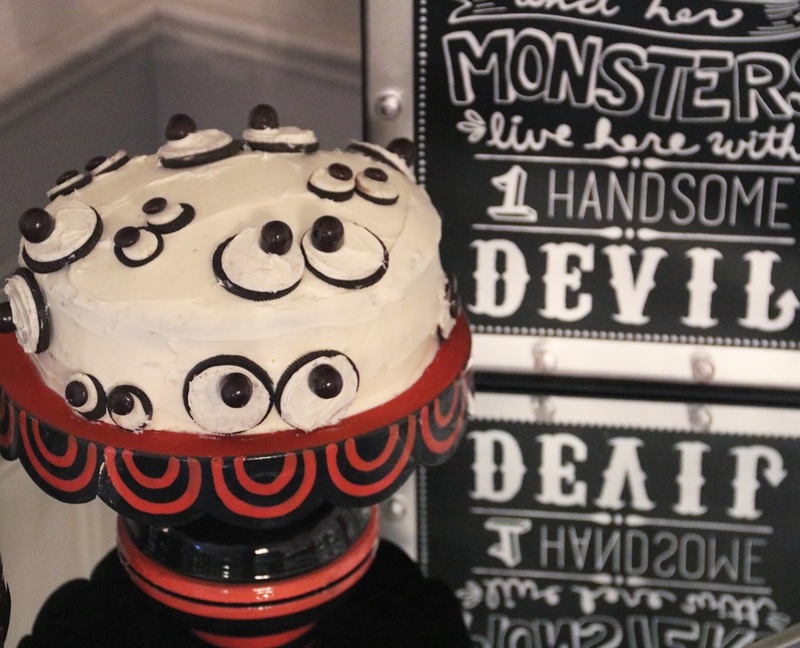 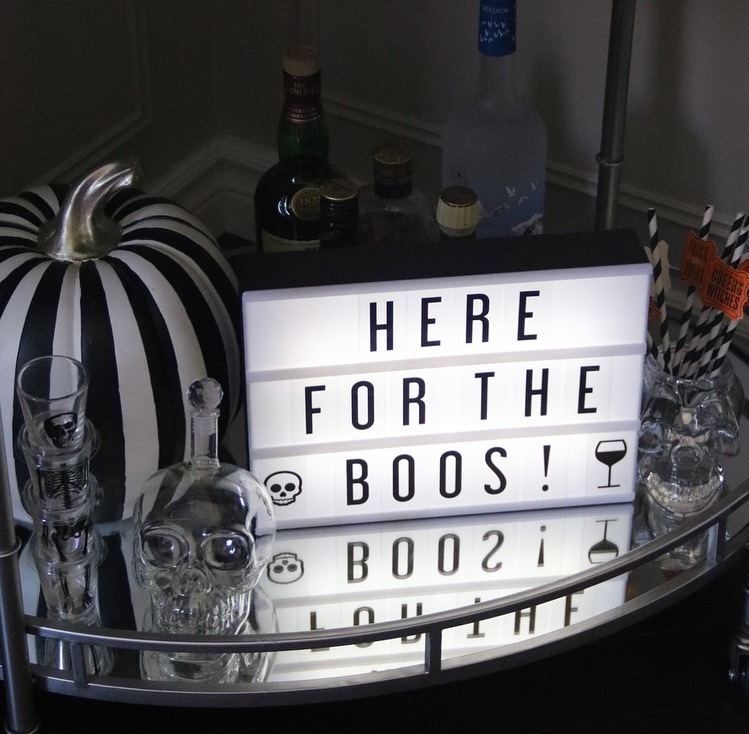 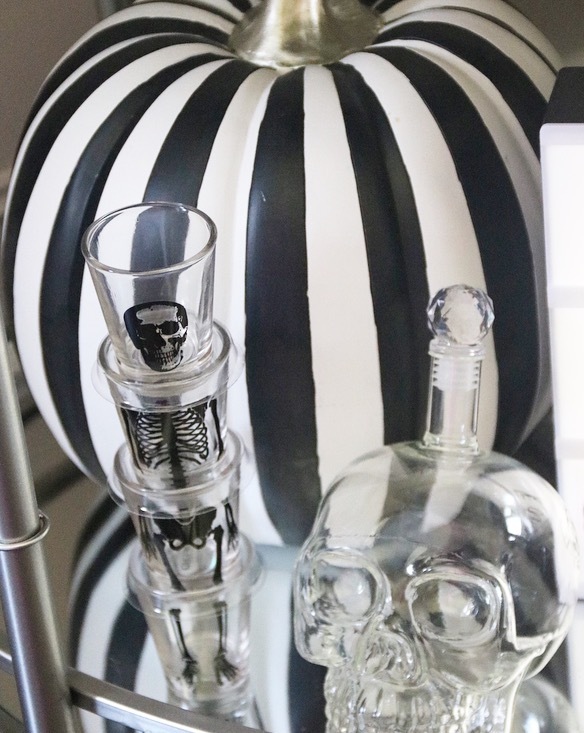 Every holiday or special occasion I style my bartcart, it is so much fun to do and you can really get as creative as you want with it! 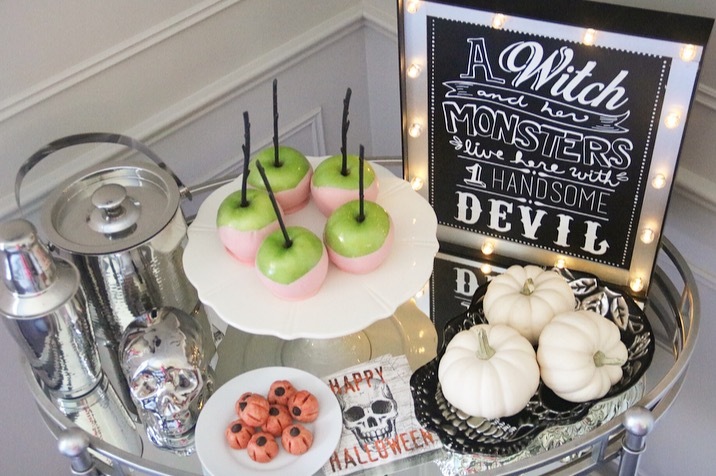 This year I used the apples as the centerpiece and went from there with decorating the rest. 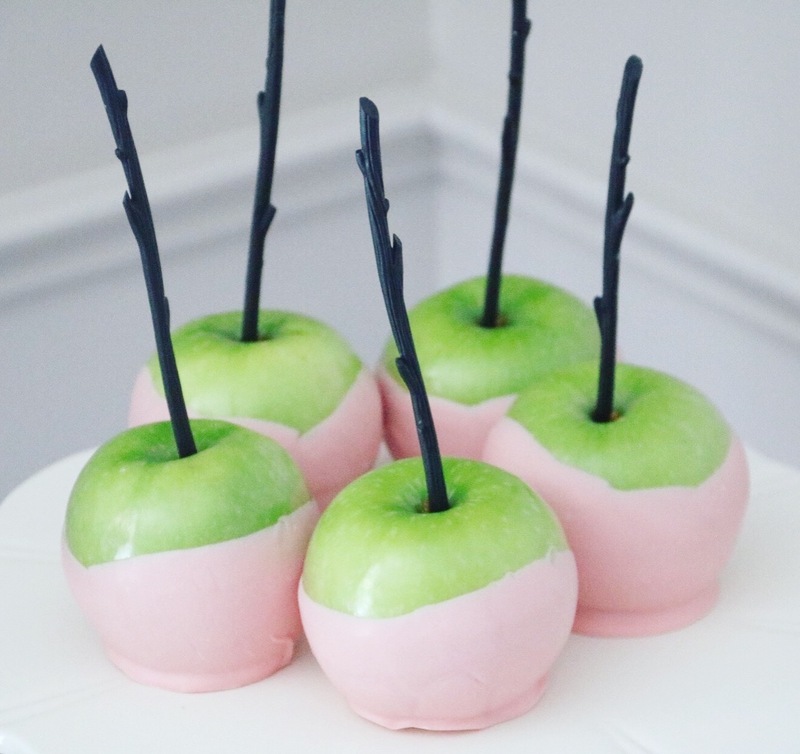 I opted for a black and white theme which really made the pink apples pop! 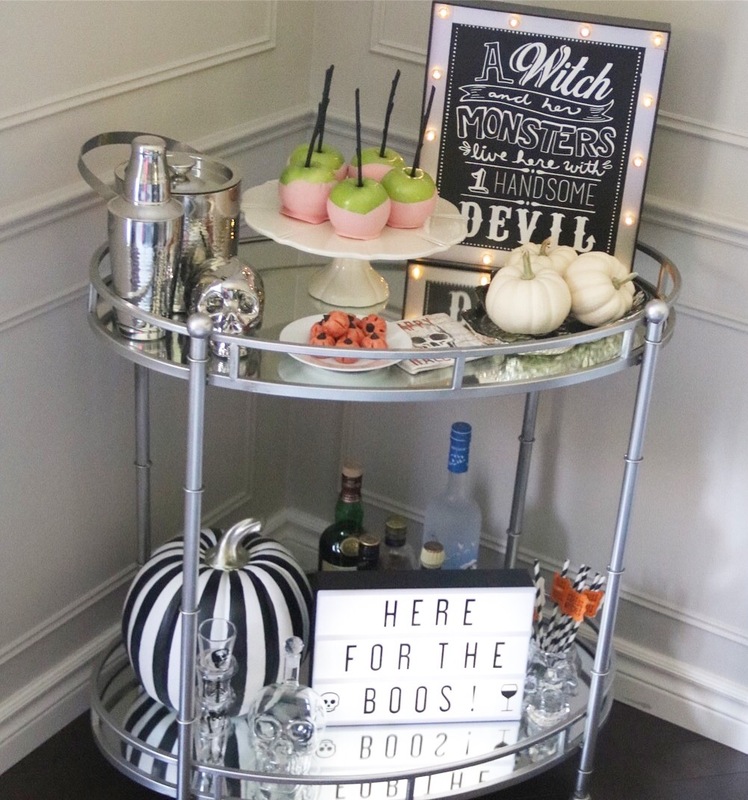 Here’s a look at my final styled bar-cart, how cute do the pop of pink apples look on here?! 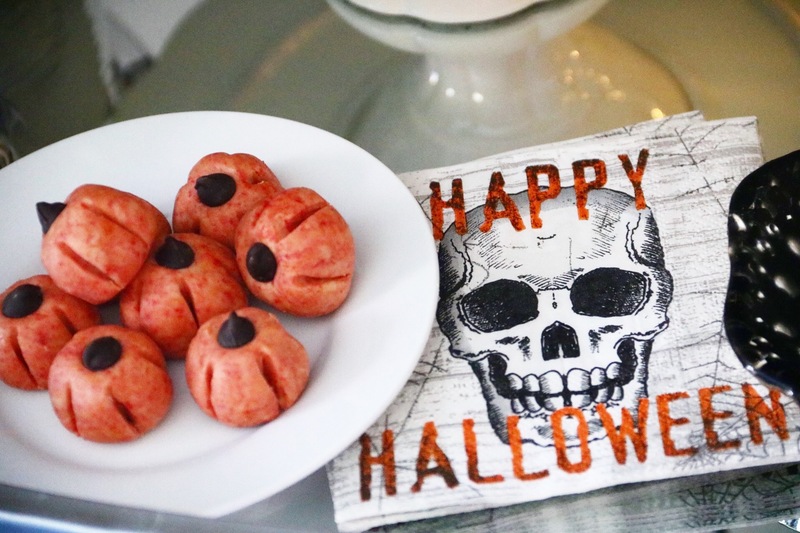 These 3- ingredient pumpkin bites were a huge hit! 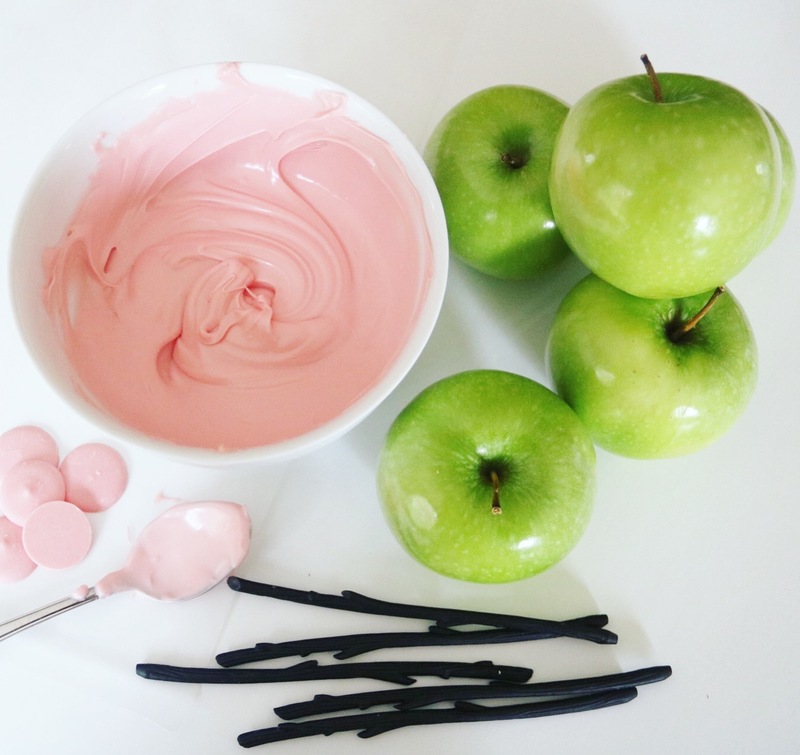 All you need is peanut butter, softened butter, icing sugar, and a little bit of food colouring! 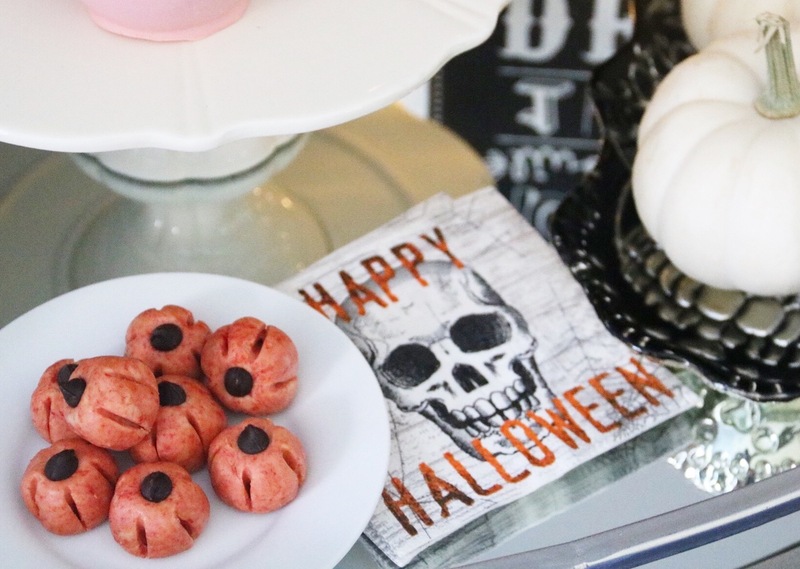 Top with a chocolate chip and use a toothpick to make the indents and you’re all set! 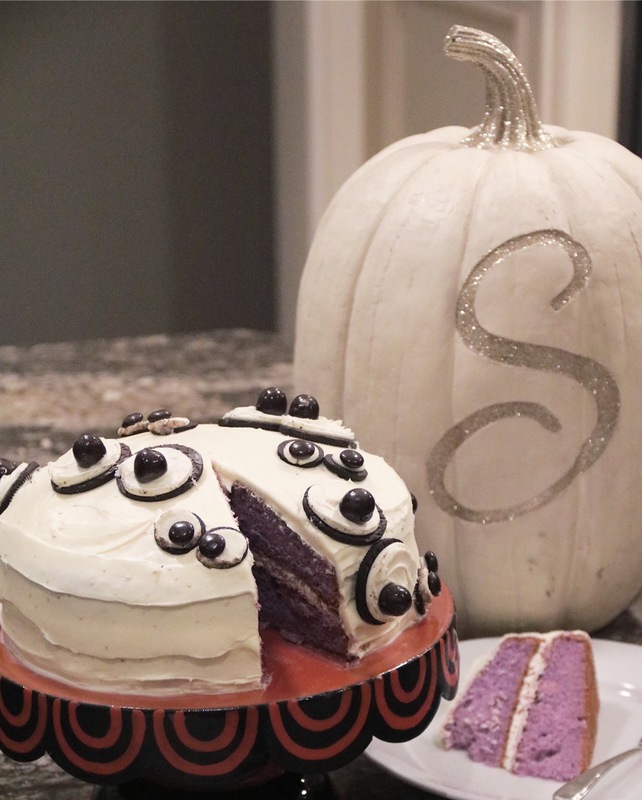 Here’s my second styling- I kept with the black and white theme and made a simple vanilla cake with Oreo (eyes) and a surprise purple colour inside!